JeepWagoneerForSale.com is an SJ (1963-1991) United States (and surrounding areas) Classifieds. This site is primarily focused on early model Wagoneers as well as AMC and Chrysler Era Wagoneers and Grand Wagoneers. However from time to time we do post later Cherokee / Wagoneer XJ models. 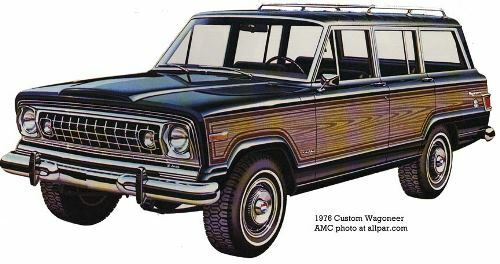 You can learn more about the various generation Wagoneers on our History page. We feature directly submitted ads from sellers on this site along with reposts from Craigslist and eBay. We do this to capture a full view of the Wagoneer market and as an added service to our visitors. Jeep Wagoneer For Sale in not only a place for potential buyers but also a reference point for sellers looking to put their Jeep up for sale. Since our initial launch we have added the ability to post directly to this site. (Click here for Ad Submission) So no longer is this site for sellers only to be used a resource for knowing how to price their vehicles. Also please note that if you are posting to Craigslist and/or eBay we should pick up your ad within a week and repost it to this site. You can however use our ad submission page as a way to expedite that process and guarantee a spot in our featured listings section and on our home page. Because we aim to offer a pricing and features history for buyers and sellers we do not remove these ads once the vehicle has been sold. We do however do our best to mark these ads as sold once we become notified that the vehicle is no longer available. If you are the current or previous owner of one of these vehicles and would like your contact information removed please contact us. This website is designed to be the ultimate resource and guide online for buying and selling Jeep Wagoneers. This includes republishing ads from 3rd party websites such as Craigslist, eBay Motors and more. This site, its owners and advertisers are not directly involved in the physical sale of any vehicle. This website is simply provided as a tool to facilitate buyers and sellers connecting for the transaction. In addition, this website is not endorsed by or affiliated with the Chrysler or Jeep brands nor is it certified by Craigslist, eBay or any other online auto classifieds resources. The use of trademarks and brand names is done so in accordance with the Fair Use clause of The Copyright Act of 1976. As this site is educational in nature, use of this copyrighted material is permitted. All trademarks and images belong to their respective owners. This website does not provide any warranties including the timeliness of updates or continued operation. The information presented here is not guaranteed to be complete or accurate. JeepWagoneerForSale.com is not liable for any financial loss or other actions in relation to the use of this website. It is the responsibility of the buyer or seller to conduct their due diligence before conducting any financial transaction. 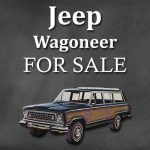 In addition, JeepWagoneerForSale.com is not required to post every Wagoneer ad from other websites or listings posted directly. Ads that have little information and no picture will typically not be featured here. JeepWagoneerForSale.com reserves the right to reject or refuse certain ads if they are not in good taste, do not meet the quality guidelines of this site. Thank you for visiting JeepWagoneerForSale.com!